Knitting and kitties and books...oh my! 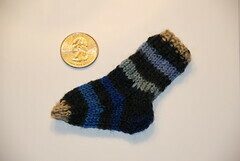 I signed up for this year's Wee Tiny Sock Swap. What fun! I love swaps, but often have a hard time getting myself organized to participate in them. This one, though, I could handle. It's made from a scrap of Opal I had left from a pair of socks I made a year or two ago. In a normal grownup-sized sock, each of those color stripes was just one row wide, but in Wee Tiny land, they are much wider. 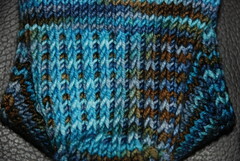 I loved how the sock was just the right size to have one complete color repeat -- note that the cuff and the toe are the same color! What is that blindingly white background that wreaked such havoc on my color balance? 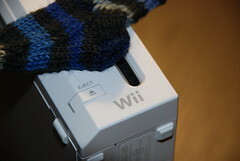 Why, it's the Wii. 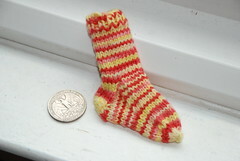 What could be more appropriate for a wee sock? 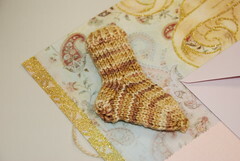 Next up is the sock I received from Nichole. I love it! The colors are so happy and springy. Nichole reports that the yarn was dyed for her and the colorway is "Strawberry Lemonade." Yum! Thank you, Nichole! Next up: not-so-wee socks. These were meant to be baby socks -- I just did a scaled-down version of my normal sock recipe -- but now that they're done I realize they're really more like toddler socks with an unnaturally short cuff. Ooops. Oh well. 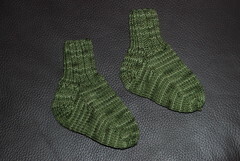 And last but not least, really not-so-wee socks. I loved my first pair of Boomerang socks so much, I decided I needed a second pair. It was hard to choose a color -- there are so many gorgeous options -- but I went with this one. Who doesn't love blue and brown together? 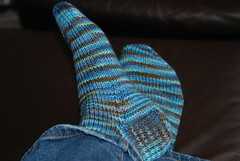 I particularly love how the colors pooled/flashed on the heel flap. 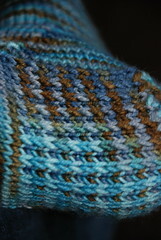 Slipped stitches do such interesting things to variegated yarn! These socks, like my other Boomerang socks, are delightfully soft and squishy and comfortable. Mmmm. No, seriously, I am finally going to live up to my promise and tell you about the Best Package Ever! Really! Honest! 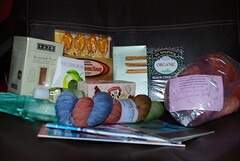 I don't think I've mentioned it (and I never got around to putting up a button), but I decided to participate in Knitters Tea Swap 4. I very, very rarely manage to catch the deadlines for signing up for swaps but I knew that this was one I wanted to be sure to get in on...I did KTS2 but missed KTS3 because I was in Seattle when signups happened. My pal was Lorena. We've not been able to converse as much as we might have otherwise (my life has just been crazy for no particular reason; hers is crazy because she's just opened a LYS!) but she's a super pal. Check out what she sent me! So many goodies! First of all, there are a bunch of tourism brochures for her area -- trying to encourage a visit to her new shop, perhaps? ;-) And there are all sorts of yummies -- orange blossom honey spoons; key lime candies; three boxes of tea (organic black cherry, assorted Tazo teas, and organic white tea and cinnamon); Disney character cookies (guess what state Lorena lives in? The key limes and orange blossoms should be a clue too...); travel-size coconut lime verbena products from Bath & Body Works; and last but not least, fibery goodness! My Very First Ever Socks that Rock!!! I admit I squealed like a little girl when I saw this. It's STR lightweight in the "Metamorphic" colorway. I love it! And there is this ball of fiber, too -- it's 4oz. 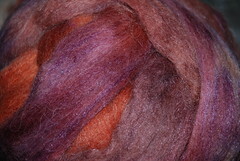 of alpaca/merino/silk, and believe me when I tell you that touching it is just like fondling a cloud. It is SO soft, I *love* the colors, and the sheen is really pretty -- it almost looks like it has a little bit of sparkle, somehow. It's Saturday! Hooray! This week was, indeed, quieter than last week. I still neglected the poor blog, but I did have time to do important things like laundry (even though I managed to ruin a few things by failing to notice that a pen worked its way into the washing machine) and doing the dishes and going out to dinner with my husband. I also spent a lot of time looking at catalogs. I seem to have gotten on the Mega Catalog Mailing List, because my mailbox is suddenly a motherlode of catalogs. Seriously -- we're talking three or four a day, at least. The daily record thus far is six. I know that it's the Christmas shopping season (the coundown clock at Westfarms last night helpfully reminded me that there are 51 shopping days left) but most of these are catalogs I have never even heard of, much less subscribed to or asked to receive. I don't mind, though -- I will freely admit that I LOVE catalogs, even though I feel the tiniest bit of guilt about the amount of paper that goes into them (but I recycle!). 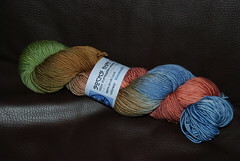 San Francisco Souvenir Yarn #1: Malabrigo Worsted. 5 skeins Damask; 2 skeins Mountain Spirit. I have grand plans to [gasp] design my own sweater out of this, with the pink as a main color and the "mountain spirit" as accent along the yoke and cuffs. "Design" is probably a strong word -- it'll probably be more along the lines of "modify an existing pattern to add a bit of contrast color" -- and who knows when I'll get around to actually doing it, but still. I love the colors! 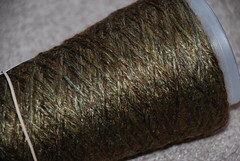 San Francisco Souvenir Yarn #2: Artfibers Galicia. The Artfibers store is very, very cool. They sell all their own yarns (and only their own yarns). There are lots of swatches and samples knitted up, and they have a "tasting area" where you can sit and knit a swatch of your own from any of their yarns. I loved that concept! 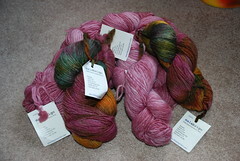 The yarns are all really gorgeous, too -- it was hard to pick just one but I didn't want to go overboard. I was there pretty close to closing and didn't have time to sample any yarns, and I'd hoped to have the time to go back but I didn't, so it's definitely on my list for my next San Francisco trip. This Galicia is lovely -- 90% silk, 8% mohair, 2% wool. I got a scarf pattern to go along with it. There are some things you just can't say no to. A new LYS for us to love!